From the Hancock County Courthouse, go southwest on Hwy 22 for 7.2 miles to Devereux. Turn right (at the backwards fork) onto Main Street. Go 0.2 mile to the dead end and turn left on Jones Chapel / Devereux Rd. Go approximately 2 miles to Powell Grove road on your right. Turn right on Powell Grove and go 1.4 miles to where the pavement ends at the intersection of Powell Grove, King Road and Sandy Run Rd. Turn right on King Road and go for 0.4 mile. Walk 500 feet through the woods on your right. 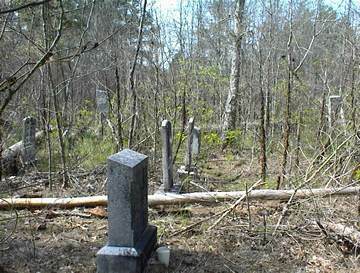 The cemetery is surrounded by granite posts and a wire fence. GPS or a guide is suggested. "Just in the morning of his day, In youth and love he died." w/o A. B. Jones. About 60 years.